개요: Directed to believers away from home in a work situation. Discusses temptations, lack of fellowship and need of it. Scripture quotes on adultery, temptation, repentance, cleansing. You who are believers in Jesus, and are away from your village at work--I have a word for you. It is hard to live like a believer when you are away from home. Others may laugh at you. Some say they are Christians, but they do much sin. Maybe there is no pastor to help you. Perhaps you think, "Nobody in my village will know if I do bad things here." Remember this, God is watching you all the time. If you are a true Christian, Jesus lives in your heart. He knows everything you do. If you do sin, He is very sad. There are many temptations for you. Bad women want you to sin with them so they can get your money. God's Word says, "Can a man take fire into his bosom, and his clothes not be burned?. . . Whoever commits adultery with a woman . . . destroys his own soul." If you are married, you must be true to your wife. If you are not yet married, ask God to give you a girl who is a true believer to be your wife. Until then, keep your life pure. Others may ask you to gamble with them or drink spirits. This is sin. Do not join with other boys when they do these things. On Sunday you should gather with other believers to think about God and sing hymns. Some Christians are weak. 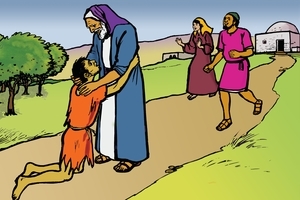 You must try to help them to walk Jesus' path better. Maybe you are already walking the path of sin. If you are following Satan's path, you are in danger. Leave your bad fashion, and return to Jesus' path. /optional song: "I've wandered from God's path, But now I am sorry. The path of sin ends in death. Lord, I'm coming back to your path. Coming back, coming back. I will not leave again. Your love has won me. Lord, I'm coming back." GRN has recorded a version of this script in 41 languages and dialects. See full list.